Licences not allowing the creation of derivative works (for example, CC BY-ND) contradict the third R (i.e. the right to revise and adapt content), so such content cannot be considered as OER according to this understanding. Another possible definition is offered by OECD, according to which OER are “teaching, learning and research materials that make use of appropriate tools, such as open licensing, to permit their free reuse, continuous improvement and repurposing by other others for educational purposes” (OECD 2016: 17). 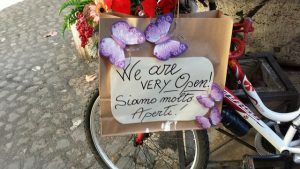 In this case, the emphasis is also on the possibility – from both a technical and legal perspective – not just to access content, but also to produce derivative works (e.g. the possibility to translate a textbook into another language). While an author’s rights are usually the main aspect under consideration when discussing the notion of openness in OER, there are other important elements that may constrain the ability of users to retain, reuse, revise, remix or redistribute resources. 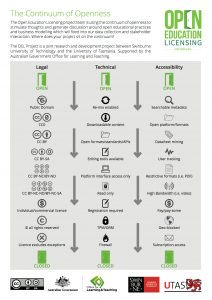 The Open Education Licensing project, a joint research and development initiative between Swinburne University of Technology and the University of Tasmania in Australia, has created the illustration below to illustrate different levels of openness around technical and accessibility dimensions, apart from legal permissions.